This Bob Sloan creation forms a central part of an environmental enhancement scheme at Strabane’s Bowling Green and consists of original sandstone taken from the old flood wall which was replaced after succumbing to the power of the River Mourne during the 1987 flood. 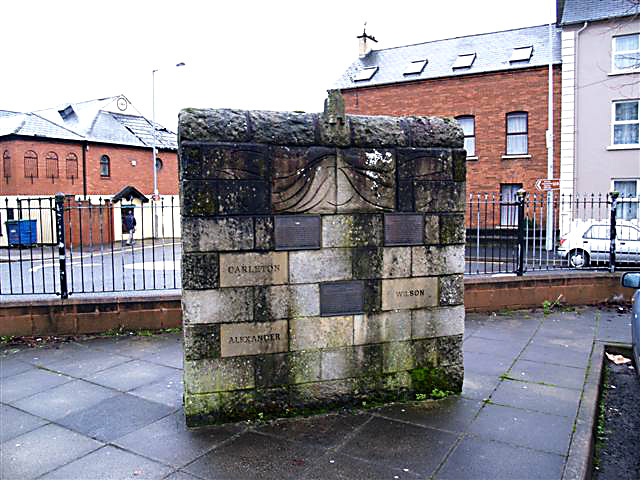 Carved at the centre of the frieze are two motifs which symbolise the core essence of the town of Strabane itself: the first -depicting the ferry across the River Mourne which was established on 26 July 1629 by the Hamilton family who were the principal landlords at the time, and the second- a castle turret representing the three castles which once dotted the local landscape at different points in time. These motifs are to be found also on the Strabane District Council Crest. Moving outwards from these central motifs are 6 individual bronze plaques cut into the sandstone at various points, containing information on some of Strabane’s most influential sons and daughters : George Sigerson, Sir Guy Carleton, Woodrow Wilson, John Dunlap, Brian O’ Nolan, and Cecil Frances Alexander. These interpretative panels and their outward movement from the core motifs represent a parting of ways from Strabane towards the wider world. The implementation of the Bowling Green project was co-ordinated through Belfast based architects Burns & Stewart on behalf of Strabane District Council and the Department Of Environment.